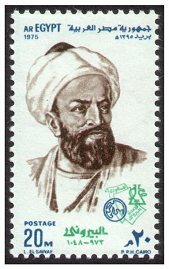 Abu Raihan Mohammad Ibn Ahmad al-Biruni was one of the well-known figures associated with the court of King Mahmood Ghaznawi, who was one of the famous Muslim kings of the 11th century A.D. Al-Biruni was a versatile scholar and scientist who had equal facility in physics, metaphysics, mathematics, geography and history. Born in the city of Kheva near "Ural" in 973 A.D., he was a contemporary of the well-known physician Ibn Sina. At an early age, the fame of his scholarship went around and when Sultan Mahmood Ghaznawi conquered his homeland, he took al-Biruni along with him in his journeys to India several times and thus he had the opportunity to travel all over India during a period of 20 years. He learnt Hindu philosophy, mathematics, geography and religion from thre Pandits to whom he taught Greek and Arabic science and philosophy. He died in 1048 A.D. at the age of 75, after having spent 40 years in thus gathering knowledge and making his own original contributions to it. He recorded observations of his travels through India in his well-known book Kitab al-Hind which gives a graphic account of the historical and social conditions of the sub-continent. At the end of this book he makes a mention of having translated two Sanskrit books into Arabic, one called Sakaya, which deals with the creation of things and their types, and the second, Patanjal dealing with what happens after the spirit leaves the body. His descriptions of India were so complete that even the Aein-i-Akbari written by Abu-al- Fadal during the reign of Akbar, 600 years later, owes a great deal to al-Biruni's book. He observed that the Indus valley must be considered as an ancient sea basin filled up with alluvials. On his return from India, al-Biruni wrote his famous book Qanun-i Masoodi (al-Qanun al-Masudi, fi al-Hai'a wa al-Nujum), which he dedicated to Sultan Masood. The book discusses several theorems of astronomy, trigonometry, solar, lunar, and planetary motions and relative topics. In another well-known book al-Athar al-Baqia, he has attempted a connected account of ancient history of nations and the related geographical knowledge. In this book, he has discussed the rotation of the earth and has given correct values of latitudes and longitudes of various places. He has also made considerable contribution to several aspects of physical and economic geography in this book. 1616° - 1 = 18,446,744,073,709,551,619. He developed a method for trisection of angle and other problems which cannot be solved with a ruler and a compass alone. Al-Biruni discussed, centuries before the rest of the world, the question whether the earth rotates around its axis or not. He was the first to undertake experiments related to astronomical phenomena. His scientific method, taken together with that of other Muslim scien- tists, such as Ibn al-Haitham, laid down the early foundation of modern science. He ascertained that as compared with the speed of sound the speed of light is immense. He explained the working of natural springs and artesian wells by the hydrostatic principle of communicating vessels. His investigations included description of various monstrosities, including that known as "Siamese" twins. He observed that flowers have 3,4,5,6, or 18 petals, but never 7 or 9. He wrote a number of books and treatises. Apart from Kitab-al- Hind (History and Geography of India), al-Qanun al-Masudi (Astro- nomy, Trigonometry), al-Athar al-Baqia (Ancient History and Geography), Kitab al-Saidana (Materia Medica) and Kitab al-Jawahir (Precious Stones) as mentioned above, his book al-Tafhim-li-Awail Sina'at al-Tanjim gives a summary of mathematics and astronomy. He has been considered as one of the very greatest scientists of Islam, and, all considered, one of the greatest of all times. His critical spirit, love of truth, and scientific approach were combined with a sense of toleration. His enthusiasm for knowledge may be judged from his claim that the phrase God is Omniscient does not justify ignorance. This page last updated 10/11/2009 12:39 P.M. PLEASE NOTE: The revealed Arabic Qur'an is the authoritative and primary source of reference and as such the Qur'anic English translations are provided purely as indicative interpretations. This Site Designed & Built By FrogWrite Creations P.O. Box 40, Greytown 5742, New Zealand. Site design and scripting is copyright © FrogWrite Creations 2009-2019 with the exception of the ticker which is provided free of charge by Dynamicdrive.com.